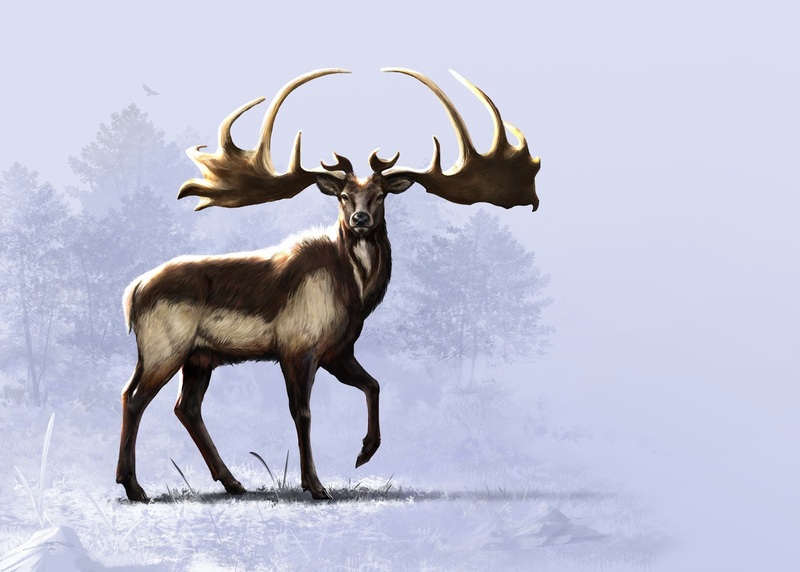 The Irish elk (Megaloceros giganteus) or Irish giant deer, is an extinct species of deer in the genus Megaloceros and is one of the largest deer that ever lived. Its range extended across Eurasia, from Ireland to northern Asia and Africa. The most recent remains of the species have been carbon dated to about 7,700 years ago in Siberia. Although most skeletons have been found in bogs in Ireland, the animal was not exclusive to Ireland and was not closely related to either of the living species currently called elk. Newer morphological studies prove that the Irish elk is more closely related to its modern regional counterparts of the Red Deer. The Irish elk stood about 2.1 meters tall at the shoulders carrying the largest antlers of any known deer (a maximum of 3.65 m from tip to tip and weighing up to 40 kg). The Irish elk is estimated to have attained a total mass of 540–600 kg, with large specimens having weighed 700 kg or more, roughly similar to the Alaskan Moose.